A Japanese leading manufacturer is teaming-up with a Queensland university to trial and develop new renewable energy technologies with the potential to make Queensland’s energy system significantly more efficient, robust and sustainable. A demo Sumitomo Electric concentrator photovoltaic (CPV) system will be installed at the Queensland Department of Agriculture and Fisheries, Redlands Research Facility in Brisbane and operated and tested by Queensland University of Technology (QUT) researchers. Professor Ian Mackinnon, from QUT’s Institute for Future Environments, promises the partnership will complement and boost QUT’s existing renewable energy research program. “Our partnership with Sumitomo Electric gives us the opportunity to study the operation of large-scale renewable energy generation and storage technologies in Queensland’s climate,” he says. 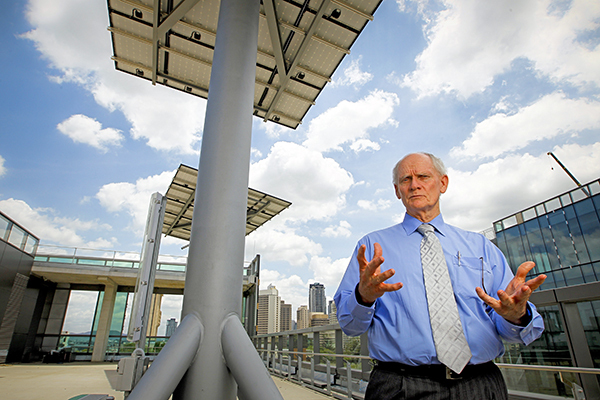 Professor Mackinnon claims CPV technology is around 2.5 times more efficient than standard photovoltaic technology. “Although they look similar to traditional photovoltaic panels, CPV systems have a layer of lenses over the top of the photovoltaic cells that concentrates the sunlight and makes the system far more efficient,” he says. The CPV system will be installed and operational at the Redlands Research Facility early 2017, when monitoring and assessment of the system would begin. “Sumitomo Electric is also seeking to demonstrate a redox flow battery in conjunction with the CPV technology in due course,” Professor Mackinnon says. QUT looks forward to a long partnership with Sumitomo Electric through which other renewable energy technologies and rapidly moving fields could be developed, such as advanced automotive systems, advanced materials and superconductivity. “QUT also acknowledges the assistance of the Trade & Investment Queensland Japan team in working to bring this exciting opportunity to Queensland and recognises the ongoing support of the Queensland Government for projects that have the potential to significantly deepen our research and commercialisation engagement with Japan,” Professor Mackinnon says.